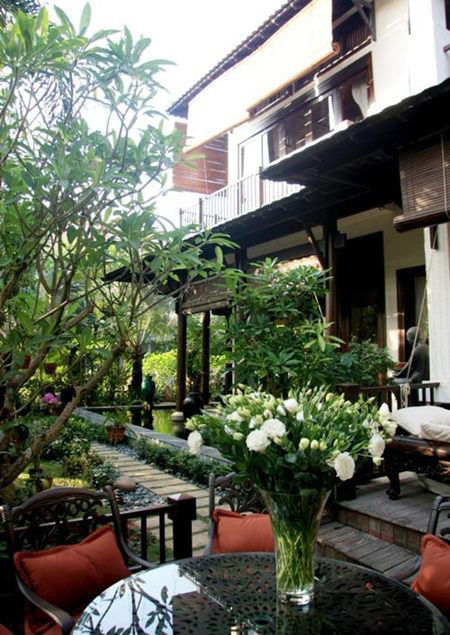 VNRE – Spacious villa of Ha Kieu Anh – Miss Vietnam 1992 in Lan Anh Villas, Luong Dinh Cua street, District 2, Hochiminh City. L-shaped house, land area of nearly 500 m2, in which 1/3 area is green. Architects have designed the house carrying shadow of a colonial villa with all rooms of the house overlooking the garden. Sitting room is arranged at center of L-shaped as main axis of the function spaces. With pure Vietnamese materials such as furniture, bamboo blinds, silk pillows, Phu Ly ceramic vase,… to put breath of Asia into the living room as well as all the other rooms. In the house, well hole is a unique creation. The walls are Champa Reliefs made elaborately as if they were stripped out from the ruined temples in the forest. Natural light combined with LED light and waterfall bring home a image of deserted tropical forest. The big transparent mirror frame around the well hole makes vivid picture of each storey. Even the terrace is also a garden, creating privacy with the adjacent house. 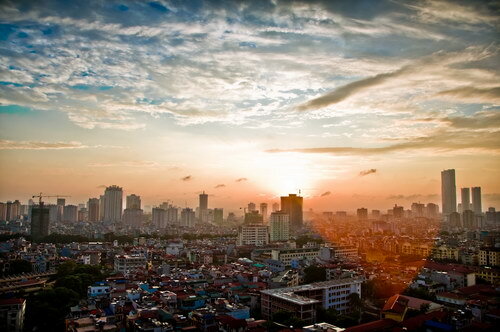 Photos courtesy of Nha Dep Magazine & Ngoi Sao.